Sometime during World War II, the Boy Commandos are assigned with the task of preventing the Nazis from getting their hands on the mystical artifact known as the Orb of Ra. Though greatly outnumbered by their adversaries, the timely arrival of the Blackhawks manages to turn the tide of the battle, and, together, they successfully drive off the German troops. Little do any of them realize, however, that the alchemist Megistus has brought the mummies resting in the nearby pyramid back to life in order to help him secure the Orb of Ra until one of the Boy Commandos, Dan “Brooklyn” Turpin, suddenly goes missing. "How the hell did his overbearing mother track him all the way to Egypt?" There IS a difference, people. To be fair, the punctuation and accent placement (acute, grave, and circumflex) are surprisingly impeccable and several of the other issues aren’t exactly beginner’s mistakes. While my French is apparently better than that of the two Andrés, it’s not exactly my first language either. This being the case, I decided to initiate a combo breaker by enlisting the aid of my friend, the lovely and talented Magali Lachapelle, to make sure that I don’t make a gigantic fool of myself by providing translations that are equally, if not more, questionable than the originals. French: Une maman a Brooklyn! English: A mommy has Brooklyn! The French translation is too literal and doesn’t convey the original English meaning well at all. It would’ve been better to translate the first two times this is said as “Une momie l’a attrapé!” (“A mummy caught him!”) and then as “Une momie a attrapé Brooklyn!” (“A mummy caught Brooklyn!”) when Dumont asks Chavard for a clarification. Magali mentions that “Une momie a capturé Brooklyn!” (“A mummy captured Brooklyn!”) is a perfectly viable alternative depending on what the mummy’s (perceived) intentions may be. French: Petit André, ce qui s’est produit? English: Little André, what happened. This one’s tricky to explain. “Ce qui s’est produit” would only be a valid translation of “what happened” if it were part of a declarative sentence or statement (“This is what happened.”) or was immediately followed by an explanation or clarification (“What happened was…”). Since we’re dealing with a question here, you’d have to translate this as “André, qu’est qui s’est produit?” or “André, qu’est qui s’est passé?” (Incidentally, Magali prefers the latter since the former sounds way too academic.) While we’re at it, I’d also drop the “petit” like a bad habit since, while it’s not blatantly incorrect, there’s pretty much no context in which it doesn’t come off sounding weird. 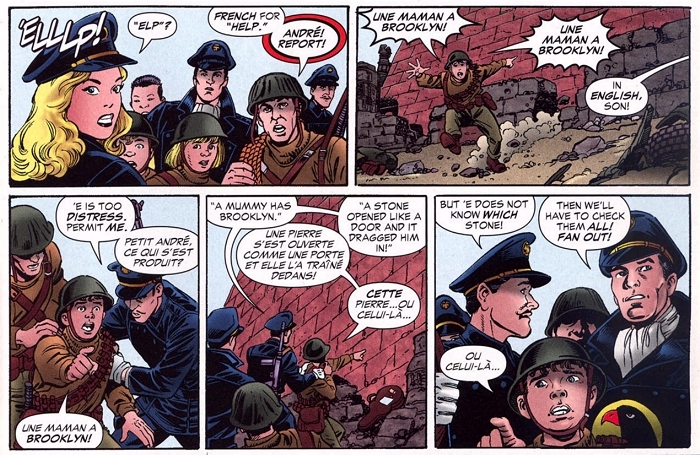 Its literal meaning (“little”) has no real business being applied to a freakin’ child soldier and using it as a term of endearment suggests a level of familiarity, affection, and intimacy that simply doesn’t exist between Chavard and Dumont since it’s established during the course of the story that this is the first time they’ve ever met. French: Une pierre s’est ouverte comme une porte et elle l’a traîné dedans! English: A stone opened like a door and it dragged him inside! Passable, though Magali suggests tweaking it slightly to “Une pierre s’est ouverte comme une porte et la momie l’a entraîné à l’intérieur.” (“A stone opened like a door and the mummy dragged him inside (of the pyramid).”). 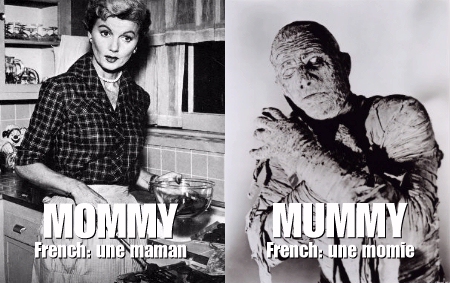 This has the added benefit of both clarifying where Brooklyn is being dragged to as well as to specify who is doing the dragging since the French words for “stone” and “mummy” (“pierre” and “momie”, respectively) both carry the feminine article. Within the context of the story, though, it’s pretty clear what’s going on even without this change.